You must contact an George Yateem (480) 258-7549 for information on how Employee Network members can receive a $750 discount for undergraduates or a $500 discount for graduates. *Subject to terms & conditions. Since founded in 1949, GCU has transformed into a leader in education offering more than 200 academic programs, including over 150 online academic programs, across nine colleges. Traditional students and working adults gain real-world and innovative learning experiences that prepare them to enter the 21st century workforce or advance their career. 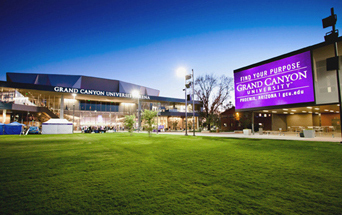 As of fall 2017, more than 19,000 ground students attend GCU’s vibrant 200+ acre campus growing with new residence halls, modern academic buildings, labs with advanced technologies, student support resources, popular eateries, state-of-the-art athletic facilities (such as GCU Arena, GCU Stadium and Brazell Field at GCU Ballpark) and more to support well-rounded college experiences. Students have numerous opportunities to get involved that include worship events, music productions, student clubs, academic organizations, community service projects, club sports and 21 NCAA D1 athletic teams. at 480-258-7549. You can also visit gcu.edu/empnet for more information. GCU enterprises (the Student Ad Agency, GCU Golf Course, GCU Hotel, coffee shop GCBC, The Lope House Restaurant, the Lope Shop and Canyon 49 Grill) provide real workplace environments for students to engage in hands-on experiences. For over 70,000 online students, an innovative, digital platform supports dynamic digital learning and connections to full-time faculty in small class sizes. GCU’s 100% online programs provide the flexibility for professionals to learn according to their schedule while continuing to work full time. Also, as an anchor institution, GCU has a mission to revitalize the community, create safer neighborhoods, bring in businesses to create jobs and build a STEM workforce. The university’s Habitat for Humanity partnership, initiative United by Purpose and GCU enterprises support this transformation in the community.